Shrubs or perennial herbs, to 3.5 m tall. Roots fleshy, thick but attenuate toward tip, or tuberous. Stems (in herbs) or current year’s branchlets (in shrubs) terete, with several persistent scales at base. Leaves alternate, compound; proximal 1--3 best developed, 1--3-ternate or 1- or 2-pinnate; leaflets entire or divided. Flowers solitary and terminal, or 2 or more per shoot and both terminal and axillary, more than 4 cm in diam. Bracts 1--6, leaflike, varying in shape and size, grading into sepals. Sepals 2--9, varying in shape and size. Petals 4--13, varying in color. Stamens up to 230; filaments and anthers varying in color. 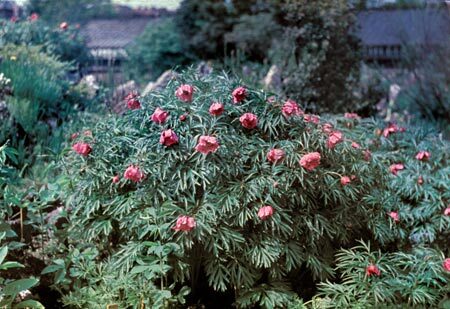 Disc leathery or fleshy, annular (in herbs) or extended into a sheath and 1/3 to wholly enveloping carpels (in shrubs). Carpels 1--5(--8), free, glabrous or hairy; ovules numerous, borne in two rows along ventral suture. Styles present or absent; stigmas laterally flattened, recurved, crested. Fruit a follicle. Seeds black or dark brown, globose or ovoid-globose, to 1.3 cm in diam. One genus and ca. 30 species: NW Africa, temperate Asia and Europe, W North America; 15 species (ten endemic) in China. Pan Kai-yu. 1979. Ranunculaceae subfam. Paeonioideae. In: Fl. Reipubl. Popularis Sin. 27: 37–59.